How do I buy digital currencies with a Credit card or a Debit card? A step-by-step guide on how to buy cryptocurrencies with a Credit card on Kriptomat. Our user-friendly platform allows you to add and directly charge a Visa or MasterCard Credit or Debit card when buying digital currencies. The process of buying with a Credit card is practically instant. NOTE: For security reasons, you can buy digital currency with a credit or debit card only if your card supports ‘3D Secure’. To determine if your card supports 3D Secure, you can contact your credit/debit card provider directly. Some banks will require various security steps to authorize a purchase using 3D Secure (text message, a bank provided security card, or security questions). 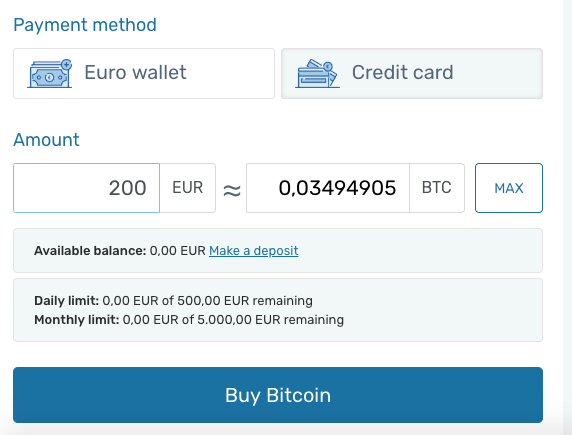 Login to your Kriptomat account and go to the Buy/Sell tab. Select the digital currency that you wish to buy. Scroll down to the Payment Method section and select Credit card (the other option is Euro wallet). Enter the euro amount that you wish to spend. Click the Buy button, which will bring you to the final step in the process. Here you have to fill out your card information and finish the purchase by clicking the Pay button. Your digital currency will be visible in your Kriptomat wallet in a few minutes! You can track the status of your purchase in your wallet, or in your History tab. NOTE: Minimum buy is 25 EUR, daily limit is 500 EUR. You can also watch our tutorial video on YouTube. If you have any further questions about credit card payments, feel free to get in touch with our friendly support team.